Futur/io is the European Institute for Exponential Technologies & Desirable Futures. We believe that companies can realize their full potential and participate in shaping our common future. In addition, we bring the experts of our Faculty in connection with companies and support them in their Moonshot projects. Our executive programmes cover exponential technologies and how to apply Moonshot Thinking within your company. You also gain access to our faculty network. If you would like to book members of our faculty please get in touch with us. Our bespoke executive programmes are built to fulfil your specific needs and goals. We help you create your own desirable future, and offer consulting services for growing projects. Use our conducted research on specific topics boosting your company goals. Our research reveals future scenarios and delivers scientific information for your future challenges. We are looking for support at our Futur/io Institute in Hamburg. Learn more. Read our latest press releases or dive into our archive to find information about older events and initiatives. The Academy’s official e-mobility partner, smart, today announces that one final ticket is now up for grabs, via the Wildcard by smart Challenge. Red Bull and Futur/io Institute announced the finalists of Red Bull Futur/io, a competition inviting creative minds and storytellers from around the globe to imagine and shape desirable futures. 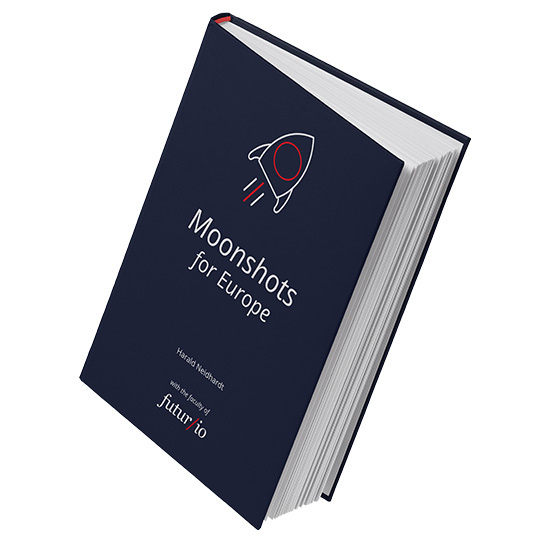 “Moonshots for Europe” discovers the disruptive power of exponential technologies for Europe and describes a way to actively steer Moonshot Thinking at corporates, NGOs, and innovative organisations. Who knows what the future holds? Red Bull Futur/io invites creative minds from around the globe to share their desirable futures.